The World War I service flag honoring all First District Normal school students who had served in the armed forces was dedicated by President Eugene Fair on July 18, 1918, and a Soldiers Memorial Fund was established to create some type of permanent memorial to those who had died. 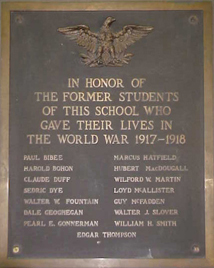 This memorial eventually took the form of two bronze plaques which were completed and installed February 1928; one contained the text of Fair’s 1918 speech and the other, a list of the honorees. They were quietly hung in the Library when received; no formal ceremony was held. 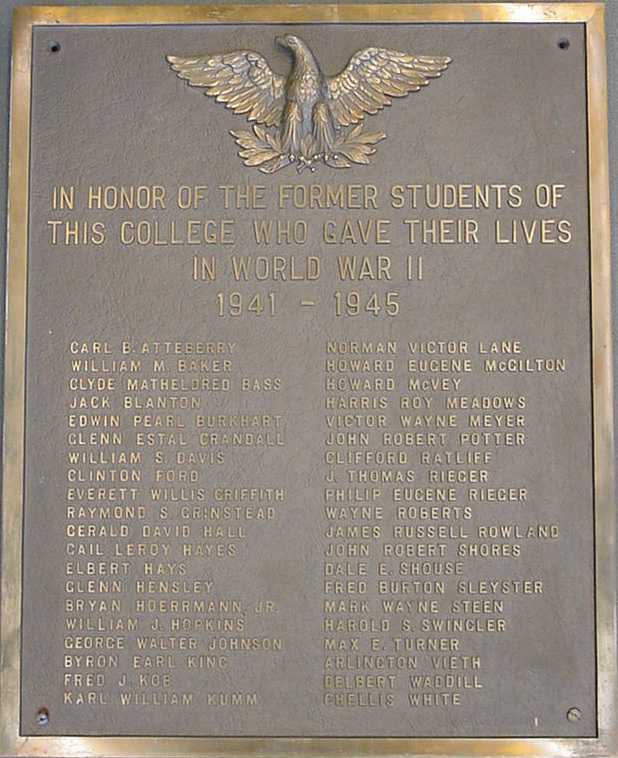 A list of the Northeast Missouri State students who lost their lives and President Walter Ryle’s 1942 service flag dedication address appear on two World War II memorial plaques. They were unveiled by four men and women representing student veterans at an Armistice Day program in Kirk Auditorium, November 11, 1948. Brigadier General Willard W. Irvine’s dedicatory address was followed by taps and a 3-volley gun salute by MacDougall-Lowe American Legion Post No. 20. 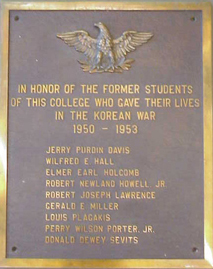 Dedication of the Korean War memorial was held in Kirk Auditorium on Veterans Day, November 11, 1957. Lt. Col. Robert L. McKinney, Assistant to the President, gave the address and Janet Howell, daughter of Capt. Robert Newland Howell Jr., unveiled the plaque on which her father’s name appears. The ceremony closed with taps and a 3-volley gun salute by MacDougall-Lowe American Legion Post No. 20. 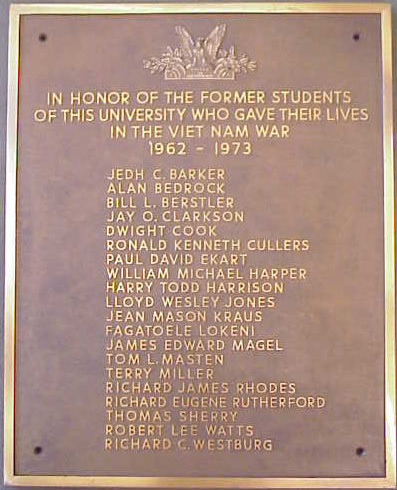 The Vietnam War memorial plaque, sponsored by the campus Veterans’ Club, was dedicated in a solemn Veterans Day ceremony on the Quad, November 11, 1980. Club President Sam Guzzo and University President Charles McClain unveiled the plaque and Bill Elmore, President of the National Organization of Concerned Veterans, gave the dedicatory address. In the spring of 2009, the four memorial plaques were permanently installed on the covered and lighted wall at the entrance to the Ruth W. Towne Museum and Visitors Center, northeast corner of Normal and Franklin Streets (across from McClain Hall).